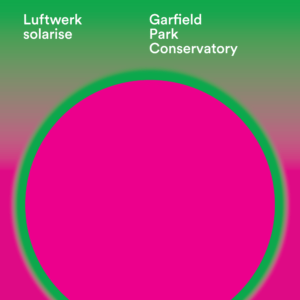 solarise: a sea of all colors is Luftwerk’s site-specific response to the Garfield Park Conservatory’s historic structure and natural collection. 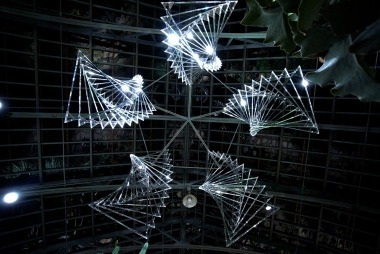 Inspired by the groundbreaking and innovative vision of Jens Jensen, the godfather of naturalistic landscape and conservatory design, Luftwerk’s series of art installations throughout the conservatory echo Jensen’s sentiment for public interaction with nature, elevating and highlighting the perception and importance nature plays in society and urban planning. 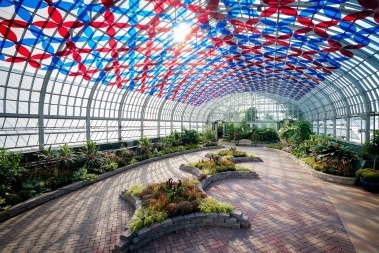 When Jens Jensen conceived the dome structure for Garfield Park Conservatory, his eye fell upon an icon of the Midwest — the prairie grass haystack. 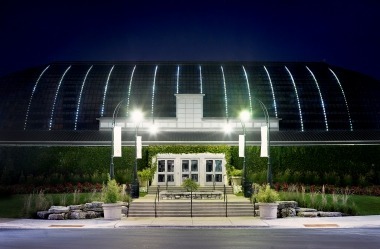 Featuring computer-programmed LED lights that run along the interior of the Palm House dome, The Beacon is a permanent installation activated by an anemometer that gauges the course and speed of the wind passing across Chicago. Translating this data to the LED lights affects the vibrancy, speed, and dynamics of the installation. Dependent upon the weather, this site-specific display creates a fluid gesture of light that mimics tall prairie grasses swaying in the breeze. Inspired by the blue and red spectrums of sunlight that plants utilize to photosynthesize growth, Florescence is a sculptural intervention of red and blue petals, hung canopy-like in an optical pattern. As the light passes through these filters, colorful shadows are cast throughout the entirety of the Show House, creating an immersive experience that heightens the viewer’s awareness of the processes by which nature unfolds. Seed of Light is a kinetic chandelier of water and light inspired by the circular geometry of the Flower of Life—the universal symbol of creation. 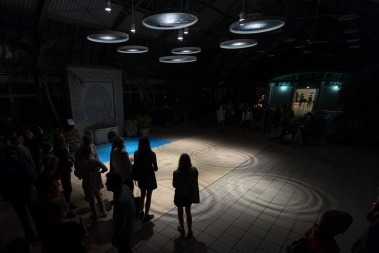 With each illuminated droplet, circular trays catch the water below, magnifying ripple shadows across the floor of the Conservatory’s Horticulture Hall. Created in collaboration with Bill Bartolotta. Prismatic evokes the cross-sectional geometry of desert plant bodies and realizes their forms into a multi-dimensional representation. By day, the sunlight shines through prismatic-shaped acrylic spokes, refracting the white rays of light into the full spectrum of its component colors. As the sun passes overhead, the display of light shifts, creating a continuous movement of light and color throughout the day. In the evening, Prismatic illuminates via intelligent LED lighting and responds to a composition of music, creating a dynamic and playful activation within the Desert House. A sound installation using plant materials from the Conservatory collection will accompany the suspended sculpture; an original composition by Owen Clayton Condon. 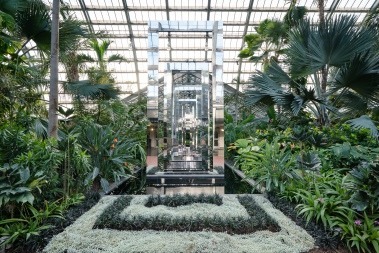 Framing the legendary “spring song waterfall,” which crowns the lagoon of the Fern Room, Portal draws the viewer’s gaze to fall directly upon the heart of the conservatory. Floating above the surface of the reflection pool, Portal performs as a frame for—and reflection of—the natural surroundings in which it is situated. With its mutli-faceted use of mirrors, the installation mimics the slick of the reflection pool, while fragmenting and abstracting the figures of flora blooming in the space. 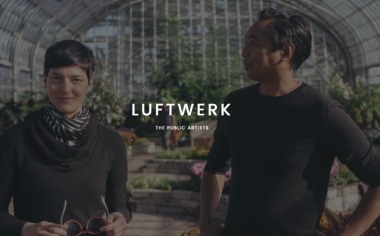 Luftwerk is the artistic vision of Petra Bachmaier and Sean Gallero. 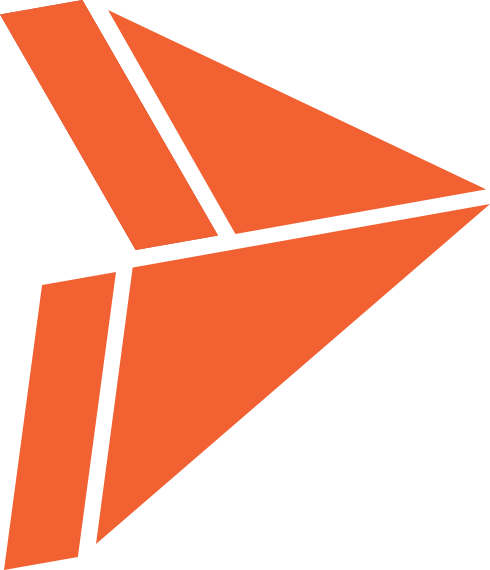 Luftwerk’s art practice focuses on the exploration of what makes a space a place and how art plays a vital role within urban and natural environments. With each individual project, Luftwerk discovers and accentuates the unique connections between architecture, environment and the communities which interact within these places, transforming their experiences of space and site through light and sound.